Breakfast is served between 8am and 9.30am every day of the week. With a sea facing location on the ground floor, you can dine in comfort and watch the sun come up over the sea. 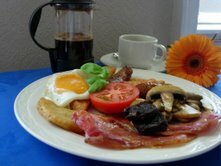 There is an extensive breakfast menu with a fine selection of locally sourced produce. Meals are cooked to order whilst you enjoy a freshly brewed ground coffee, read a paper or relax with your fellow guests whilst gazing at the beautiful view of Weymouth Bay. Vegetarian guests are also well catered for. A full vegetarian traditional ‘English’ cooked breakfast is just part of the menu that also features omelettes and fish. Each guest has their own privacy and is seated at their own separate table. Early breakfasts can be arranged for those guests catching the early ferry or train, or for those just requiring an early start. There are a number of possibilities available including a packed up take away breakfast, early ‘tea, toast and cereal’, or for those on the ‘stupid-o’clock’ ferry, there is the ‘room only’ option. If you really want to pamper yourself, or are celebrating a special occasion, for a small extra charge you can choose from our ‘breakfast in bed’ menu.